Today's share is a Card and Artist Trading Cards I made over the last few days. the mountain scene resembles watercolour. My Spirit is in the Mountains Card, a photo by jmcraftygal on Flickr. Early Espresso CS, Paper cord, Paper from my stash, Gold Marker, Red Glitter pen. And a couple of photos of the undecorated backgrounds. I really enjoyed putting all this colour to paper and hope you do too. I'll gladly answer any questions so feel free to ask. Thanks so much! Card, a photo by jmcraftygal on Flickr. 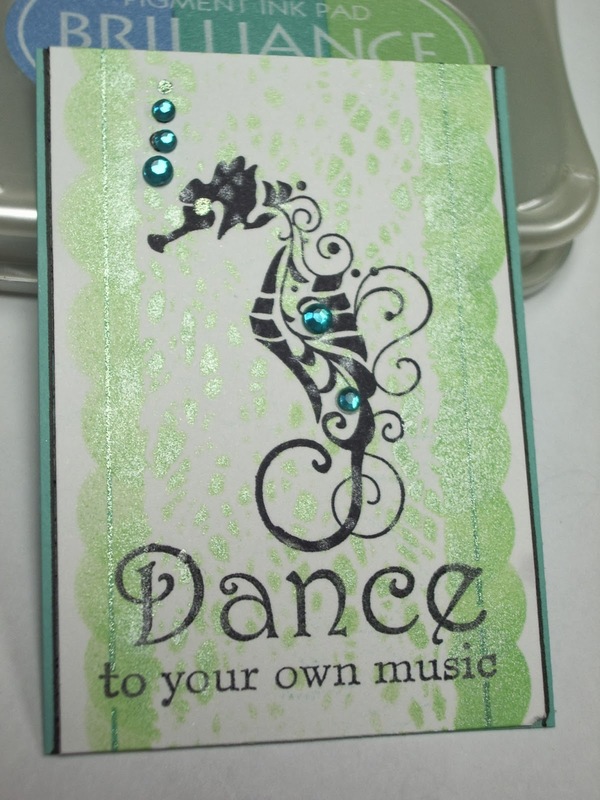 All supplies used Stampin Up! 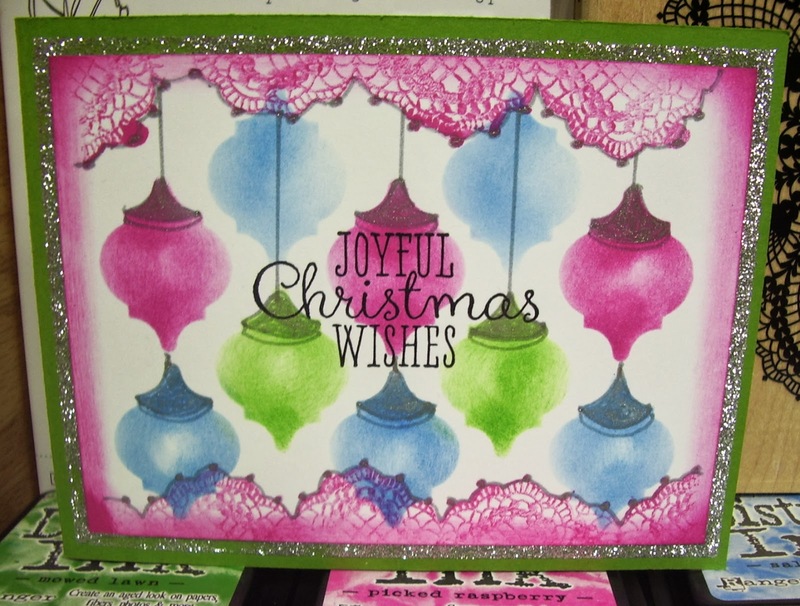 Hello, today I'm sharing a couple of Cards I made using Homemade Stencils made with my Punches. 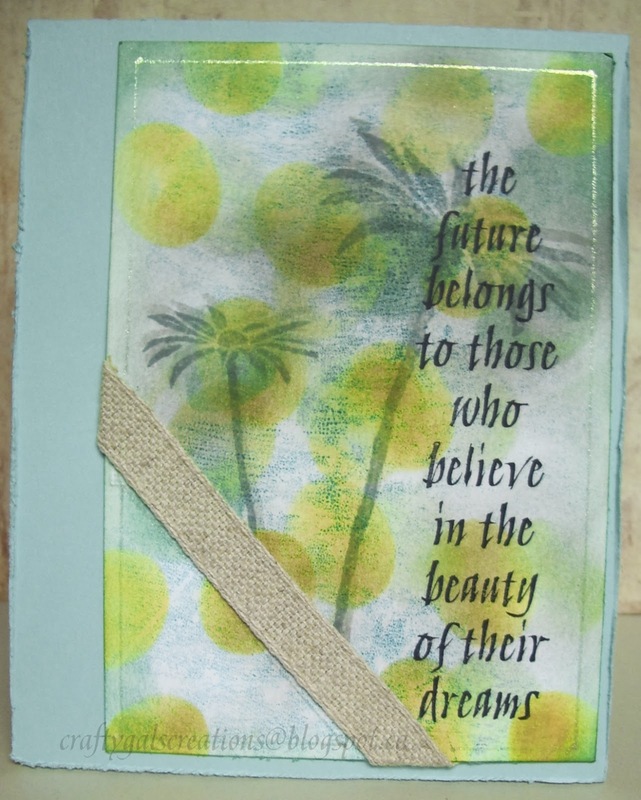 For the future belongs...Card I randomly stenciled ovals on the diagonal. 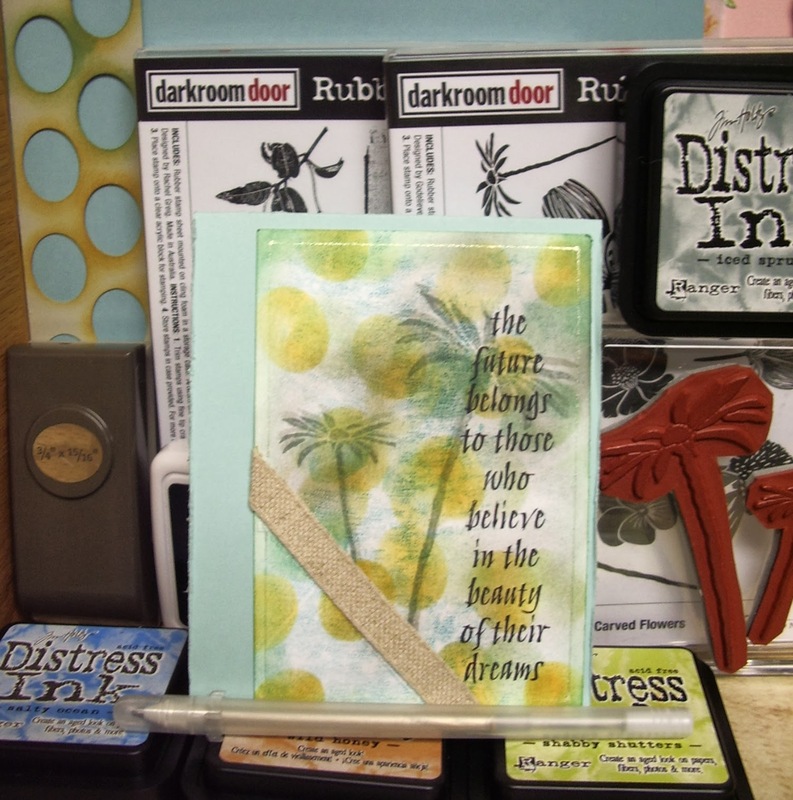 Added the Darkroom Door stamps and Stampin Up! burlap ribbon. Completed it with a simple line of glitter pen all around. Nothing too special here except I used my brayr to change a round Doily into a Lace edging. 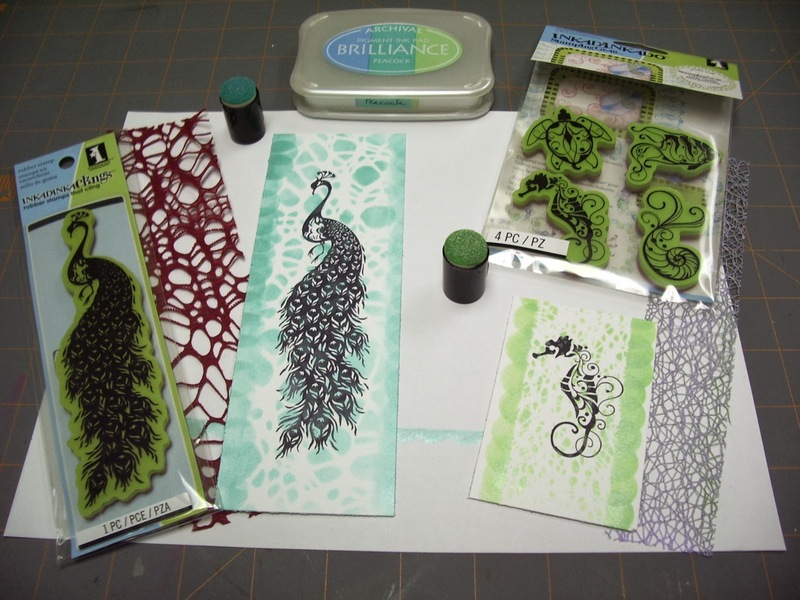 Again a photo of the Stencil and supplies used. 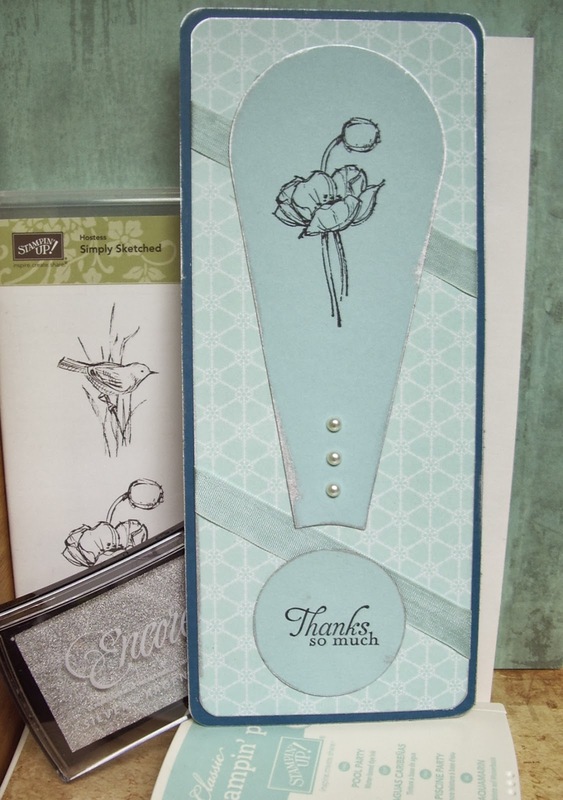 All punches Stampin Up! I hope you enjoyed your visit, I appreciated it! 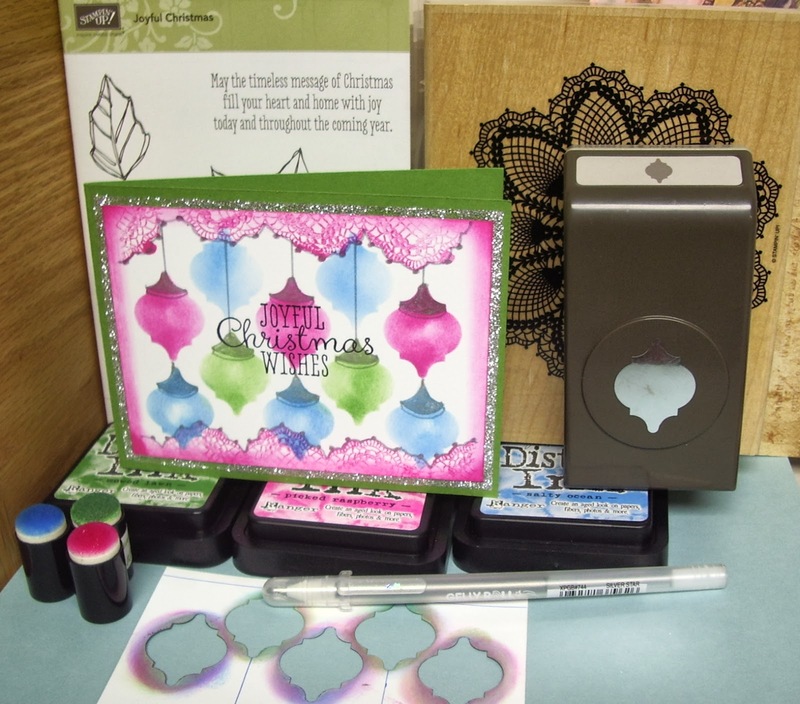 Labels: Cards, Christmas Cards, Darkroom Door Stamps, Homemade Stencil, Punches, Stampin Up! 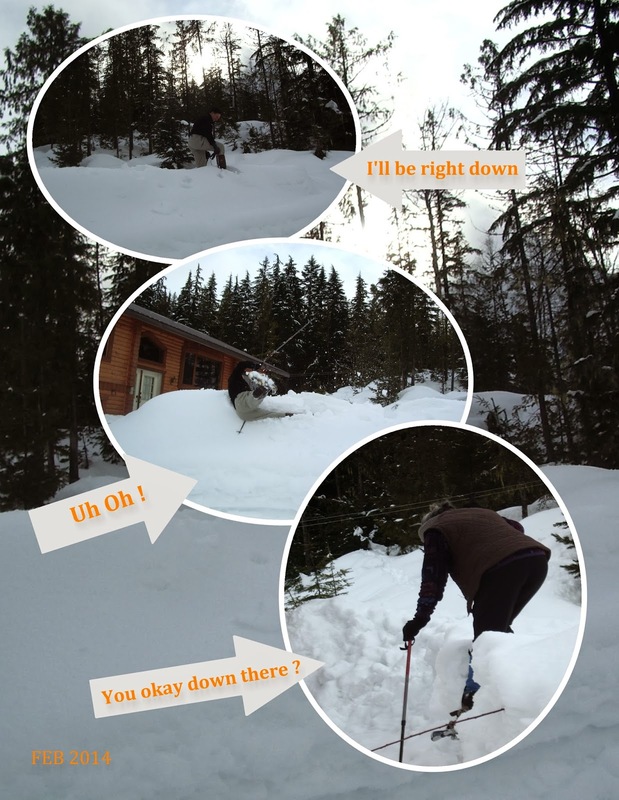 Hi there, today I have two projects to share. Can you guess what they have in common? my scrap box, thanks to Suzanne's kindness, paper cord. And please join me today at Quietfire Creations Blog. Good times abound where Crafters are found! As I share a fun and easy project to organize your craft space. Hello, another snowy day in the valley has me wishing for the wild flowers of summer. This thought is what inspired my Nature Note Card. What is a weed...Card, a photo by jmcraftygal on Flickr. Misc -Glitter Pen, Paper Cord, Ribbon, Pearls coloured with marker. 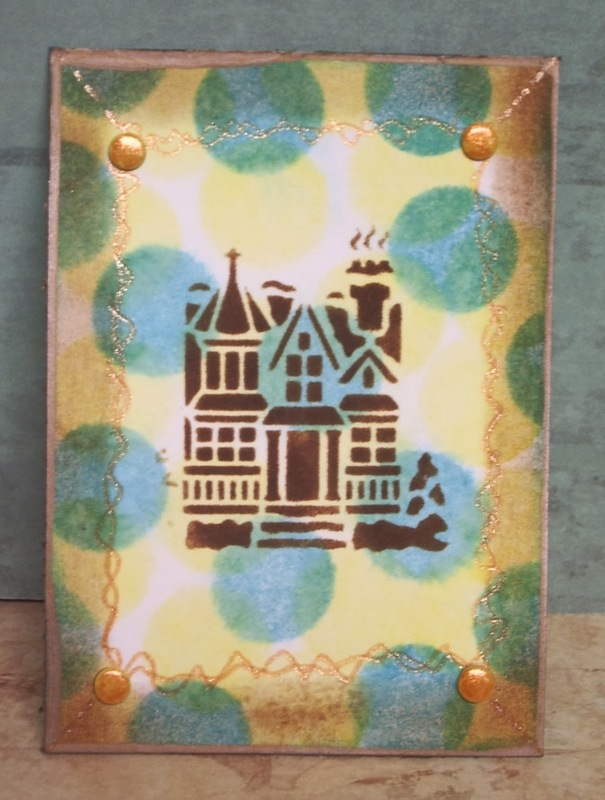 fun background I'm calling Dauber and Lace. Friendship Bookmark, a photo by jmcraftygal on Flickr. I received these bits of lace as gifts from my ATC trades and I have to say it is very cool looking! 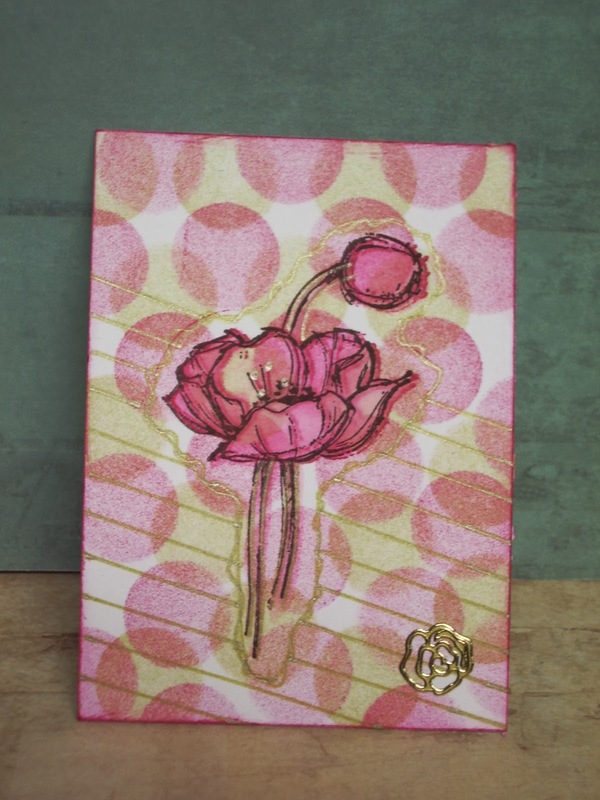 For a quick and fun background I used the Lace as a stencil and simply dabbed the ink on with a Dauber. Then made a scalloped edge by continuing along both sides of the lace. I love this Peacock stamp it is the perfect size for a bookmark. The Dance to your own music stamp is also from Inkadinkado. I Write You Letters...Note Book, a photo by jmcraftygal on Flickr. I picked up several note books with clear plastic covers that just begged to be decorated. First I applied the rose outline sticker to the outside of front cover and then coloured it in from the back (inside front cover) with permanent markers. I used brown Stazon ink to stamp the Quietfire Design Quote Stamp. Added a ribbon to complete. 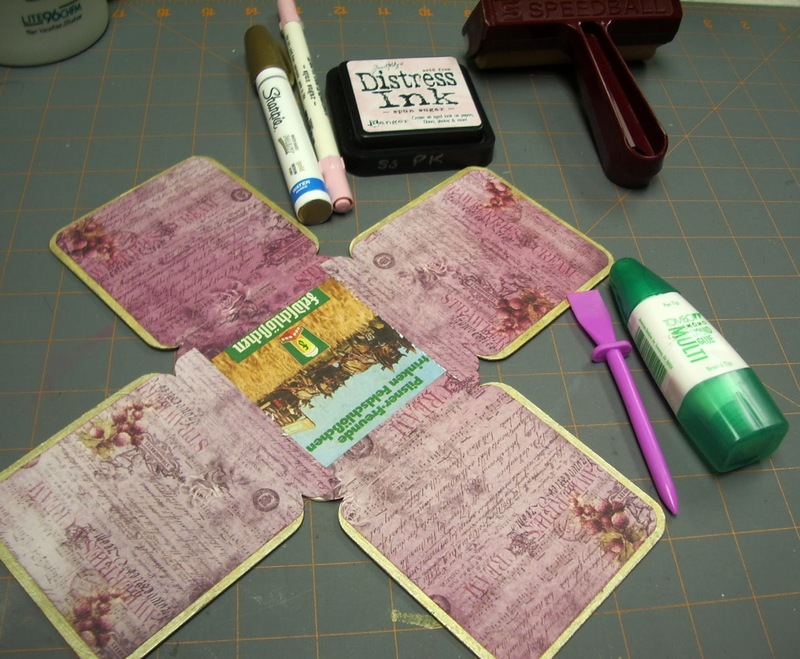 For this small note book I used this fun vintage Crayola Crayon stamp from Deep Red. Some Washi tape and felt stickers with a dab of fabric paint in the middle. A heartfelt thank you to everyone who stopped in and played along this week! This was my first Blog Hop and it has been an inspiration to me as I read through all your thoughtful comments. Saundra, please email me jmcraftygal@gmail.com with your snail mail address. And last but not least a big welcome to my Blog Patti and Con! To me you are all Queen of Hearts! Welcome to the Queen of Hearts Event! I cut the Birch Trio and Bird Memory Box Dies from card stock and set aside. Then inked up the back of the Birch Trio die with Iced Spruce DI and stamped it onto card front to create a shadow for the trees. I created the snowy background and sky with pastels and a torn strip of card stock as a mask (photo detail). Starting at the base of each tree I painted the tree shadows on the snow with Iced Spruce DI. When all was good and dry I attached the Birch Trio die cut over the tree shadow. Then randomly sprayed Smooch Spritz on all but the sky area. I cut a strip of Vellum and stamped Thinking of You with Jet Black Archival Ink then again with Silver Encore Ink. Once ink was dry I attached Vellum to card front with Double sided tape. To complete the card I added the Ribbon and Bird die cut. from my list of comments and your name will be posted on February 15, 2014. In January 2012 I started an Art Journal in an old discarded book I found. I love to grab my markers, pens or pencil crayons and just doodle. Here in no particular order are a some of my favorite pages.